I told the boys that it is suppose to hit 60 degrees later this week. Their reaction, “Woah, that is sooo hot! I am wearing shorts to school!” I had to laugh, just a few years ago that would be freezing to them, but how quickly they acclimated and after a long winter 60 may indeed feel like summer. With one day officially feeling like spring this week I may get the energy to finally pack away winter clothes and go through closets to weed out what’s too small and what will be needed for the warmer days ahead (eventually). 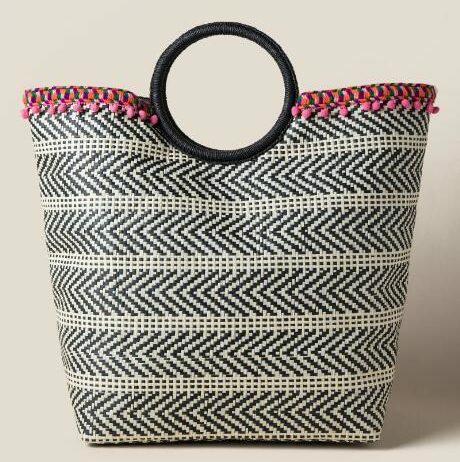 I am loving the basket weave, straw purse and tote bag look for this season. I have spotted several cute small handbags, but practicality sets in and I remember I never leave the house without a child, so bigger is better. This one looks to be big enough to hold everything, although I may not be able to find a nuk or diaper when I need it. The pink poms add a fun pop of color. 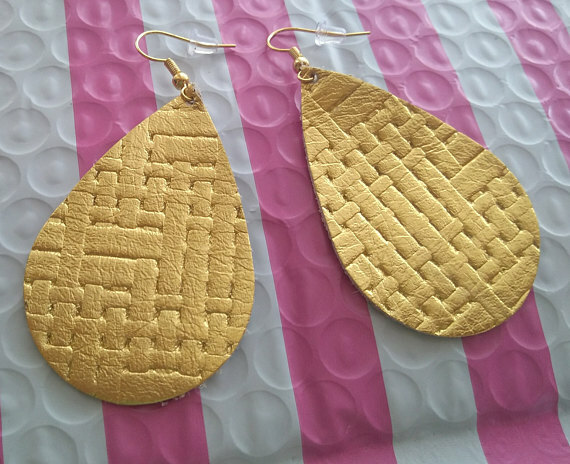 A friend of mine recently started this Etsy shop and the earrings look fabulous. A lot of different colors and patterns to choose from, most of them coming in two sizes. Statement earrings are an easy way to dress up an outfit from jeans, leggings to a fun springtime dress. My only dilemma will Caden be enamored with them as much as I am and attempt to pull them out. 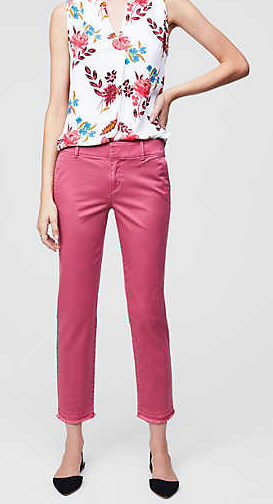 The color of these pants may shock all the neutral tones in my closet, but it may be good to shake things up a bit. I have found girlfriend chinos to be my postpartum best friend when it comes to finding something that fits well and flatters without accentuating the leftovers. I have also spotted these that are a bit more subtle in color. Now if the weather would stay warm enough to wear pants that show my ankles.